Before taking the Central Florida job to work with Scott Frost, Troy Walters was at Colorado coaching wide receivers and serving as the team’s recruiting coordinator. He remembers wideout Jay MacIntyre and there are a few more leftovers from his time in Boulder. Walters is also familiar with the Nebraska-Colorado rivalry, even though the last meeting was eight years ago. “Growing up as a kid, I used to watch it,” he said. “It’s a special game for many reasons.” But his focus isn’t really on the emotional side of a rivalry renewed. 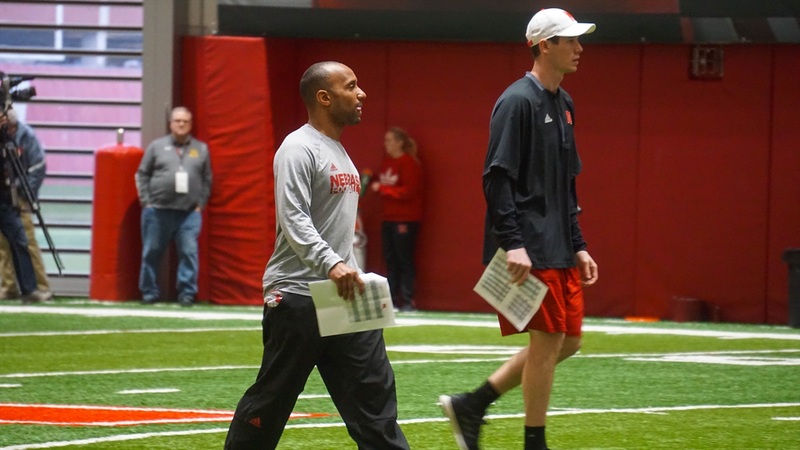 With three days to go before Nebraska “opens” it’s 2018 season, Walters is locked in on the technical stuff. Asked if Colorado’s front would force the Huskers’ offensive line to change anything in their approach, Walters just shook his head. And that’s where Walters wants to see the Huskers dominate on Saturday. He said it’s going to be important for Nebraska’s receivers to make plays against a talented secondary when the ball is in the air, but it’s going to be even more imperative to win the line of scrimmage. Monday and Tuesday provided plenty of optimism about how the Huskers would perform following Saturday’s disappointment. Head coach Scott Frost said as much on Monday and then defensive coordinator Erik Chinander doubled down Tuesday. Walters pumped the brakes a bit Wednesday. “Monday and Tuesday were excellent. Maybe the best Mondays and Tuesdays we’ve had in our three years together, it was that good,” he said. “Today guys were a little tired and we didn’t build off of what we established Monday and Tuesday. >> Athletic Director Bill Moos held an impromptu press conference Wednesday to offer some updates and clarification on the canceled Akron game. Moos said if there's another weather-related issue like Saturday's in the future, there will be better communication. "As we’ve dissected our protocol on situations like this, we’re modifying it," he said. "From now on I think it would be best if I came upstairs and we had a little makeshift press conference so you can get your questions answered." You can read more of Moos' comments here. >> Walters was the latest coach to acknowledge a team’s jump between games one and two, but he did say there’s a benefit to the Husker offense in the fact Colorado still has no tape on them. Beckton also said freshman tight end Cam Jurgens is a hot commodity among the position coaches. Jacob Padilla has more here. >> Freshman running back Miles Jones wasn’t in pads leaving the practice field Wednesday. >> Quarterback coach Mario Verduzco was pleased with how each of his quarterbacks performed on their game tests before the Akron game. Frost said Monday freshman quarterback Adrian Martinez looked ready, Verduzco echoed those comments. We’ll have more on the quarterbacks later. >> Recently retired running back Tre Bryant ran out of the tunnel with the team on Saturday. Running backs coach Ryan Held said that was something Bryant came to the staff about and they were more than happy to do it. Held said Bryant is still around the team and helping out with things off the field. Nebraska won that game 30-3.